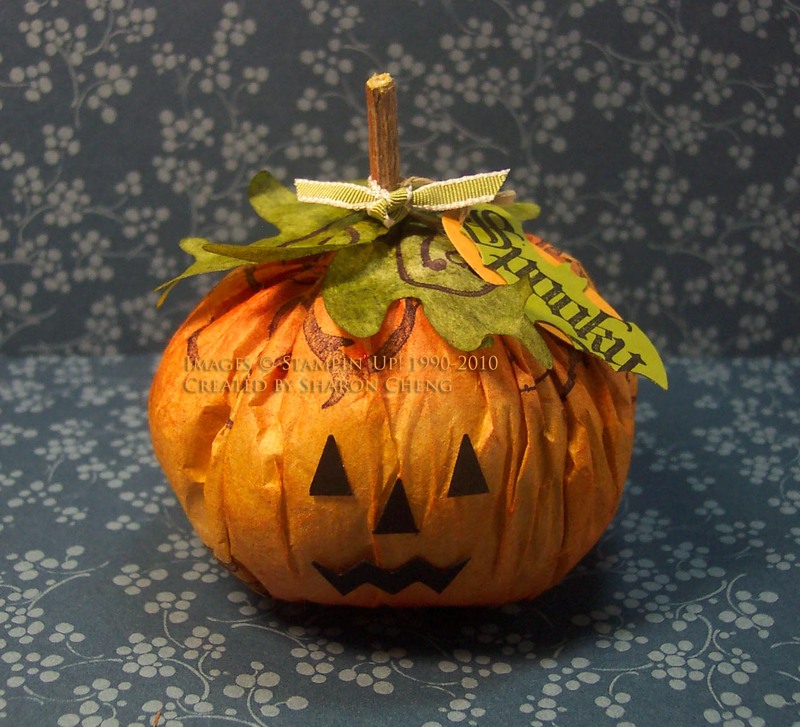 I have a Halloween workshop coming up next Sunday afternoon and decided to convert the Vintage Pumpkin into a Jack-O-Lantern. Click here to see the exact same pumpkin without its Halloween outfit. I used removable adhesive on all of the Halloween parts. That way the same pumpkin can be used for the rest of the fall season. For the eyes and nose, use the star punch. Cut off the tips of the star to make the eyes and nose. For the mouth, I used a piece of the skinny rick rack from the Tasteful Trim die. For the bat, I used the Spooky stamp from the Wicked Cool stamp set and the bat punch. This little Jack-O-Lantern is really too cute to be spooky. The class will be in south Fort Worth on Sunday, Sept. 19th from 2 - 5 pm. 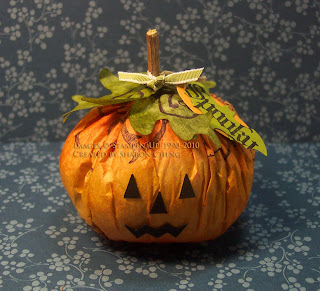 You can make this pumpkin and other Halloween projects. Please contact me for more information about the class. I was at the regional on Friday, and I loved your projects. I was very impressed. Sharon, this is too cute!! I love it!! Thanks for sharing!! This pumpkin is a cutie, Sharon! Thanks for sharing the tutorial. Have a great day!